Kyle Busch won the pole for the Camping World Truck Series race at Bristol Motor Speedway Wednesday afternoon by laying down a lap at 122.968 mph. However, Busch will start the O’Reilly 200 on Wednesday night from the rear of the field because his engine broke and will have to be replaced before the race. 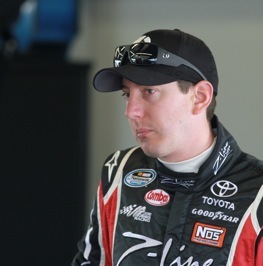 The pole was Busch’s fourth in eight attempts this year. He has two victories and five top-five finishes. James Buescher was second fastest with a lap at 122.733 mph. Elliott Sadler in the No. 2 Kevin Harvick Inc. truck was third fastest and Johnny Sauter was fourth. Defending series champion Ron Hornaday Jr. was fifth, followed by Brad Keselowski. Point leader Todd Bodine is 14th.